Visitors enjoyed a day of free activities on Saturday 19 May to celebrate the launch of ‘Whitefriars in Bloom’ with a Royal Wedding-themed garden party in Whitefriars Square. Watch the video here! The charity raised over £290 on the day from donations for their Royal Wedding-themed cupcakes and floral themed children’s face painting. Alongside this the charity also sold an array of flowers and garden plants, homemade cards and pottery, which had been made by the students. Visitors were treated to a bee display from Canterbury Beekeepers who shared their knowledge and expertise about all things bees, which went down a storm as they sold a record amount of their locally produced honey. Vintage jazz and swing group, Swing Noir, kept guests entertained throughout the day with their toe tapping renditions of music from the 1930s, through to the 1960s which had many children and adults up and dancing. 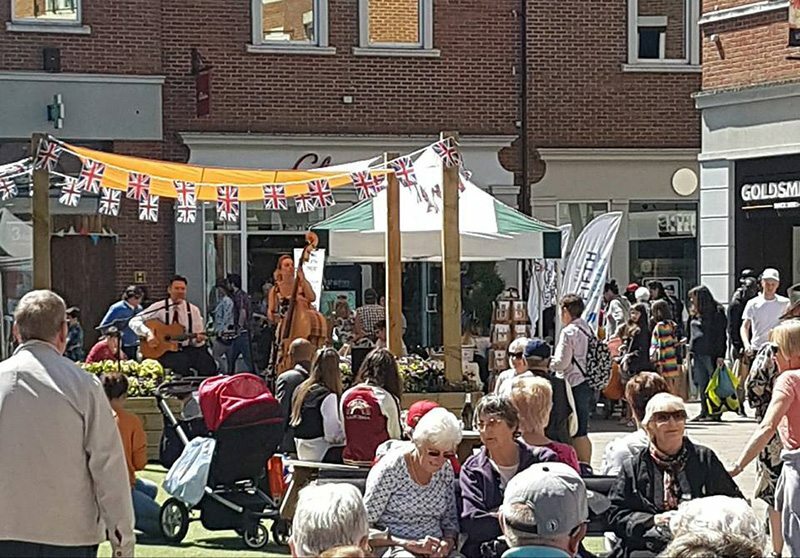 Whitefriars will host a summer of activities including children’s art and craft workshops, a Father’s Day event, a summer market, live music in the square and much more. To keep up to date with the events planned please visit our ‘What’s On’ page here.